Scores of children spending three days making music! This intentional non-competitive festival brings together young choristers from different part of Europe. Everything about SCHOLA CANTORUM is to promote respect and enjoyment, while working in WORKSHOP at the high level, building HARMONY of vocal chords and hearts among all participants. The festival will start in Poggibonsi, 28th of April late in the evening, with the “open singing happening” and welcome party. 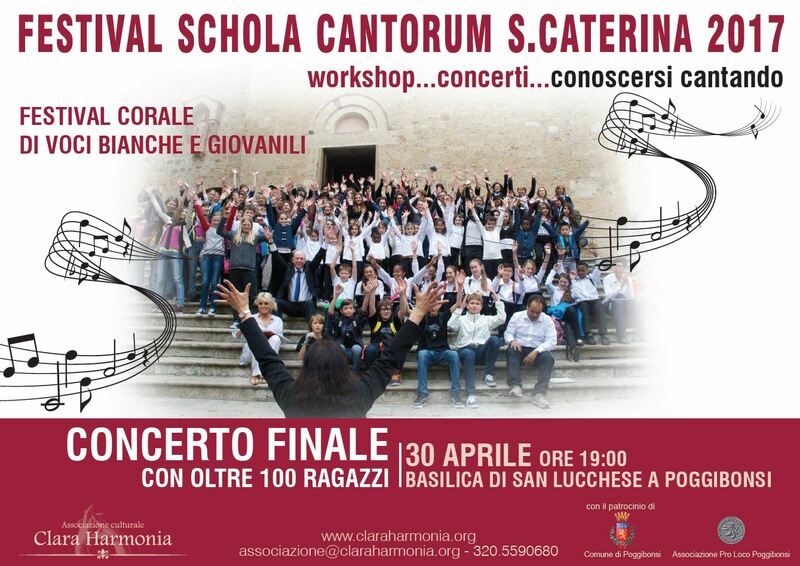 On Saturday 29th, the festival will take place in beautiful Siena the whole day with a performance at the end of the day. On Sunday, the 30th, the session will continue in Poggibonsi. The students will have a great opportunity to spend fantastic days, working in choral workshops with different renown conductors an interesting and various vocal program. Each of these two days will end with a singing performance. Monday May 1st morning will start with final “Open singing”, a solemn delivery of certificates to each participant and a final good-bye picnic. Thus will end your International Festival “SCHOLA CANTORUM S. CATERINA 2017”. Your memories of performing in historic locations, working with the selected conductors and the friendships made along the way with the warm Festival participants will linger for a lifetime!